The Agent 00Funk Mark II (pronounced "agent double O funk mark two") turns bass guitars and other electric instruments into instant funky squelching fatness. The Agent 00Funk Mark II features a highly resonant lowpass filter that sweeps up or down with every note you play giving you a super-punchy automatic wah tone. Listen to it now! Based on our highly acclaimed original Agent 00Funk, the Mark II squeezes extra funk into a more convenient, easier to use package. Now with true bypass and only the best quality analogue electronics, the Agent 00Funk Mark II is perfect for all you clean sound freaks. For maximum squelch, the new envelope input allows you to use a clean envelope prior to fuzz or distortion. Plug the Chunk Systems Brown Dog gated bass fuzz pedal straight in to create some truely amazing synth tones. Now if you need a little wood on your fire and your pedal is limp and has no desire, then you better call my friend Agent-00Funk that'll put some jump in yo fonk, for real-doe! Check out who's using Chunk. See our answers to frequently asked questions about the Agent 00Funk Mark II, click here. Suitable for bass guitar, electric guitar and other electric instruments. True bypass - input is connected directly to output when switched off. Four controls allow you to fine-tune your sound. Runs from a single 9V battery or external power supply (not included). Convenient form factor includes no-tools battery drawer. Sturdy steel case finished in a lurid purple. High quality soft-feel foot switch. Compatible with Brown Dog for crazy synth tones. High quality analogue electronics throughout. Two pole lowpass filter with logarithmic sweep for extra funk. Wide range non-optical sweep circuit for better resonance and reliability. input - signal from your instrument comes in here. envelope - connects to Brown Dog for maximum squelch. output - signal goes out to your amplifier here. 9vdc - plug in a regulated 9V DC 2.1mm supply here. The pitch control determines the filter frequency when the input is silent. You use it to determine the overall pitch of the filter effect. Turning it lower will tend to give you fatter, bassier tones while higher settings will affect only the higher end of your sound. The smoothness control determines how quickly the filter sweeps in response to changes in input level. If you set it low, the filter will make large, jerky jumps on each note. This tends to sound squidgy and warbles a little as the filter responds to individual audio cycles. If you set it high, the filter makes smaller, slower movements. Adjusting the sweep control changes how wide the filter sweeps are. When you set it low, the filter sweeps over a narrow range and is not very responsive to the dynamics of your playing. When you set it high, the filter sweeps over a wider range and the dynamics of your playing will have a greater affect. The squelch control determines how extreme the filtering effect is by adjusting the resonance of the filter. As you turn it higher, the filter has a higher gain at the filter frequency and accentuates those frequencies more, making a "squelchier" sound. The switch determines the direction of the filter sweep. In up mode the filter starts low and sweeps up to higher frequencies. This can add a lot of punch to the start of each note as the filter sweeps over the fundamental frequency. In down mode, the filter starts high and sweeps lower, which gives a different type of sound in which the note tends to get swallowed in the middle but returns at the end. The following samples were recorded with an electric bass and an Agent 00Funk Mark II. The pictures show the control positions that were used to record each sample. Click on the sample names to listen to the sounds. Further down you'll find sounds which also use the Brown Dog gated bass fuzz with the special envelope connection to create some nifty synth bass effects. The control positions for the Brown Dog are also shown where it has been used. Turn all controls straight up and get your star glasses on for that classic envelope filter sound. Brown Dog not used for this sound. Add a little more squelch and turn down the pitch to get superfreaky. Brown Dog not used for this sound. Turn up the smoothness and the squelch and you've been touched by a smooth criminal. Brown Dog not used for this sound. Turn down the smoothness, turn up the squelch and run; this sucker's out of control. Brown Dog not used for this sound. Switch to down mode, turn up the pitch and turn down the sweep. Watch out - its hungry. Brown Dog not used for this sound. Look - up in the sky! Its a Moog! It's an Prophet! No its Chunk Systems. A bit of fuzz, some nice sweeps and its time to kick back and let it all hang out. Turn the squelch and the drive to the max to blow your mind! Make some sound effects straight out of 1978 with the down mode and maximum smoothness. 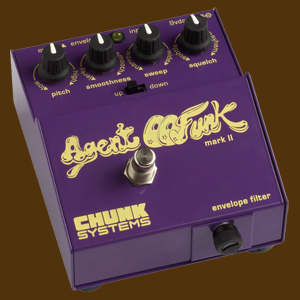 View or download the user manual for the Agent 00Funk Mark II as a PDF here. We also maintain a FAQ that might help clear up any questions or problems you have after reading the manual. Copyright © 2005-2007 Chunk Systems. All rights reserved.